This 1936 Seagrave on a Ford chasis was the engine at NLR Station 3 from 1936 until 1947. It replaced the older apparatus, which was no doubt worn out. This was the last open-cab fire pumper purchased by North Little Rock, as is the oldest known surving pumper of the NLRFD. 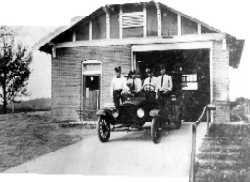 The fireman standing next to the right front tire is the late Chief Roy Nichols, who was the NLRFD'S Chief when this vehicle was ordered. 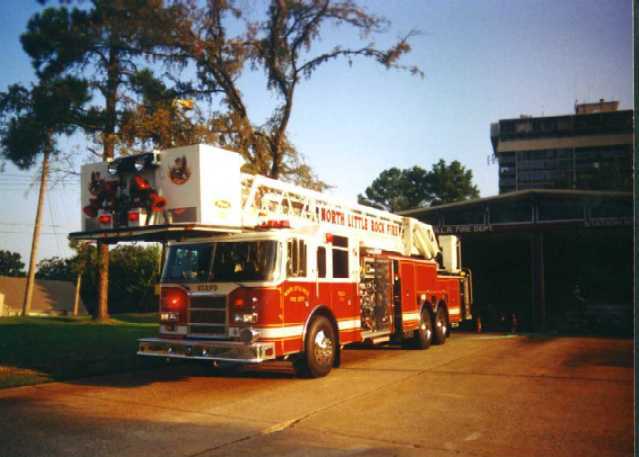 He once told me that Seagrave was the apparatus he most prefered. The 36 Ford/ Seagrave was assigned to Station 6 in Levy after the two '47 American LaFrance pumpers arrived in late 1947 (or early 1948) , and one of the two new LaFrance pumpers was assigned to 15th and Pike. and gave Levy a closed-cab apparatus. The June 7, 1951 Arkansas Gazette shows a picture of the newly arrived '51 Ford/Seagrave. In June, 1951, The '36 Ford became a reserve pumper. still owns the apparatus today.